It was with some amusement that I viewed the circus from the helicopter as we descended into set. There were people and equipment everywhere, and this was only Second Unit. The two picture helicopters were already on the ground, guzzling from the fuel truck. Hair, makeup and wardrobe trailers, the grip truck, camera truck, star wagons, honey wagon, genny and the all-important catering truck were arranged in the gravel pit that served as our staging area. Even Crew Parking was impressive. All told, the unit totaled close to fifty people who would blow through several tens of thousands of dollars today. It might look like overkill for what seemed a pretty simple Second Unit shoot, but this was Hollywood -- big budget, primetime television. After coffee and breakfast burritos, we had meetings. The inevitable meetings. Producers, Associate Producers, Executive Producers, Production Assistants, Stunt Coordinator, Assistant Directors, Safety Guys, Location Manager, Cast Members, Stunt Doubles - they all had to get in on the meetings. The stunt guys are frequently the center of attention at these events because they always have little toy vehicles that they use to pre-visualize their work. This morning they were crouched down in the center of the large circle of attendees, holding brightly coloured toy helicopters, flying them around making realistic sounds and deciding how it all would play out on our televisions. Steve, the camera ship helicopter pilot and my long-time partner in the aerials business, watched the proceedings and looked across the circle at me, grinning. Having been through this many times before, we knew what the stunt guys and Assistant Directors didn’t: once you get into the air, all bets are off. Everything changes. Everything looks different. That’s why we put cameras in helicopters in the first place. Meetings over, it was time to go to work. Pilot Steve, Producer Richard and I decided at our own meeting to do the hard stuff first. With the three of us in the camera ship, we’d shoot most of the helicopter chase material before lunch and save the relatively easy over-water gag for late in the afternoon when the light was better. On this warm summer day, the first thing we do is provide ourselves the rare luxury of removing all four doors, the better to see the action around us. Steve and Richard sit up front while I sit crosswise behind them, facing out the right hand side. With the backseat of the helicopter removed, I sit on the floor with the lower half of my body outside, my feet resting on the skid. Once in position, I can see hardly any helicopter at all. The entire world floats past me, unobstructed. It’s the best seat in the house, just as it should be. That’s where the camera always belongs. Airborne at last, I smell the sunlit forest beneath my feet and take long, deep hits of the cool mountain air. Today is a gift. Normally I’m fighting cold air and bundled up like the Michelin Man, but today I wear sneakers, jeans and a shirt. I’ve never, ever been too warm shooting aerials, but today will prove the exception. As a group, we move out into the middle of the valley and turn our attention to shot design. On a real set this is called “blocking,” an intensely creative and time-consuming process. But with three helicopters in the air, each costing close to two thousand dollars per hour, we don’t have the luxury of time. Our first task is to design a sequence of shots that can be filmed quickly and safely, and that will be exciting to watch while advancing the story. Although we have a pretty good idea of what we need, there is no shot list. Even if we had one, we couldn’t read it. With all four doors off, it’s very turbulent inside the helicopter and everything not tied down becomes a safety hazard. Besides, Steve and I can usually think up far better shots than those guys down on the ground. That’s what they pay us for. You couldn’t ask for a better location. The air is calm, the light is perfect, the mountains surround us, and the evergreen forest looks gorgeous. A silver river far below threads the valley floor and the sky is clear. We have everything we need to make good television. We’ll need exits and entrances, two-shots, singles, drive-bys, escapes and captures, near misses, good guy successes, bad guy mistakes, accusations, retributions. You know, a chase. 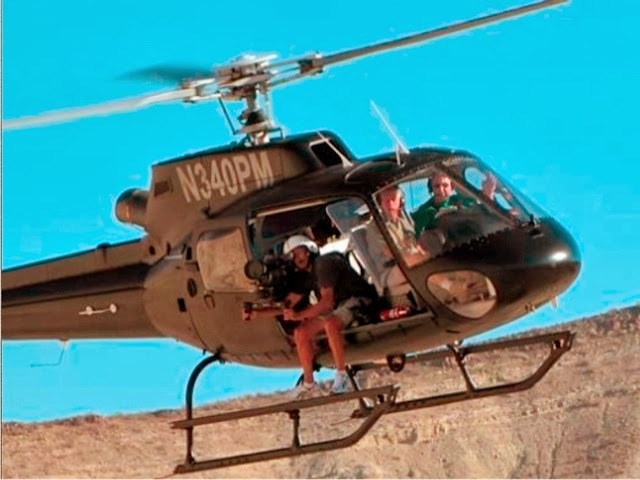 The helicopter exteriors will intercut with the already-shot poor man’s process material of the actors yelling at each other as the chase progresses. “Lines”, I believe they’re called. The dialog unit does all the work. We have all the fun. And fun it was. Air-to-air is by far the most demanding of all the variants of aerial photography, and since there were two picture helicopters, this was an even more technically difficult shoot. For most of the morning we three helicopters chased each other up and down the Seymour River, alternately skimming low over the treetops, then high across the mountain peaks, banking and turning, the camera chasing the other two aircraft as they chased each other. The helicopter is truly a magical machine, at once the ultimate hotrod and a magic carpet. The view from my seat is both spectacular and exciting and I’m continuously presented with creative opportunities for my camera. It is a great way to earn a living. Steve’s having fun, too. 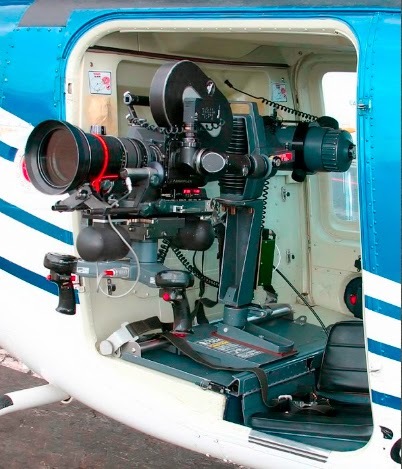 Like cameramen, pilots love shooting aerials. Repeatability, accuracy and safety are part of their daily job, but aerials test their flight and creative skills to the limit. We have a superb partnership, for just as I have learned about helicopters and how they fly, Steve has learned over the years to think like a dolly grip, a crane operator and a camera. Communicating over the helicopters intercom system, Steve, Richard, and I work up the shots between us while Steve instructs the other helicopters on positioning and timing. With three helicopters in the air at once, the simplest error can be deadly, so maintaining good communication is critical. Our chances of getting good footage are excellent, but so are the chances of disaster. We need to be fast, good, and safe. And there’s always the clock - the ticking dollars-clock that measures our productivity in hundreds of dollars a minute. Even the camera is expensive: every time I roll it burns through roughly a dollar per second in film alone, not counting processing and printing costs. We can’t afford to waste film or time, which is why we shoot all the rehearsals. Mountain flying like this is a very stressful environment, but things are going well, and I’m having amazing fun. Days like this are why I got into the business in the first place. * Photos of helicopters and camera mounts courtesy of Tyler Camera Systems to provide examples of the equipment described. Neither Peter, his crew, nor the actual helicopter/camera rig they used are pictured here. Great post! You should guest on Dollygrippery sometime!